These images were also taken on our Memorial Weekend trip to Port Huron. This is the only seagull shot that I felt worth posting. I would have had more, but that darned buffer on the D100 was constantly full. Turning the corner under the bridge, there's quite a few ships that pass this way daily. If you're in a pleasure craft and you see this, RUN! 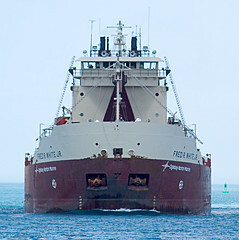 This huge freighter is turning to make the turn under the Blue Water Bridge and down the river.